Halloween, Christmas, Easter and for every little reason in between it seems candy is forced on my kids. Don't get me wrong--I love candy. But today, there is so much junk in candy. It concerns me about how much junk there is and how it is affecting our bodies. I can't (or don't want to) give candy up. However, I want it to be healthier. But can healthier and candy go together? Can you have a cleaned up candy that still tastes good? UnREAL Candy thinks so. 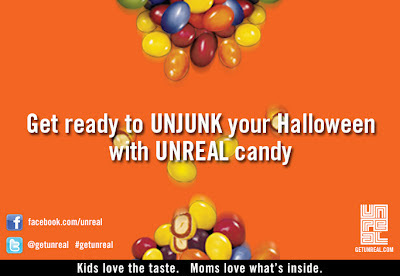 Unreal Candy started because a 13 year old boy asked why Halloween candy was so unhealthy. After arguing with his father, he researched to find that candy is loaded with junk--hydrogenated oils, artificial colors and flavors. He also discovered that the ingredients didn't make candy taste better, it was just simply cheaper to produce. So, he and his father figured out that candy without the junk could be made and it would taste better. And they did. They created UNREAL Candy without corn syrup, without partially hydrogenated oils, without the GMO's, without artificial flavors colors and preservatives. And the big one--with 40% less sugar on average. The question is, does it taste good? I put it to the test. I hosted a party and invited many of my fitness friends (after all, we are concerned about what goes into our bodies and what goes into our kids bodies) and a couple other friends. They came over and ate lunch, but were most excited to taste the candy. All the goodies for my party! Now, remember, I am one of those people. You know--picky. The one who can taste differences a mile away. The one who knows milk is going bad the day before. The one who tastes burnt before anyone else. Would it live up to my standards. Before I even got my party kit, I was curious and grabbed a bag of candy coated chocolates with peanuts (you know, like the ones that melt in your mouth, not in your hands). I ate them. They were good. Simply that, they were good. It was chocolatey and peanuty and it was good. Love the beautiful NATURAL colors! For my party, I bought comparable candies, you know, the ones with all the added junk. We did some side by side blind taste tests. Although we could all tell a difference, it still tasted great. With all the benefits (above) of less sugar plus added fiber. But we all loved the taste of the candy! When I looked at the nutritional labels of all the UNREAL candy compared to leading brands of similar candy, it is amazing. Sugars are up to 48% less! Fats are less. Overall calories are 10-39% less. And there is fiber! 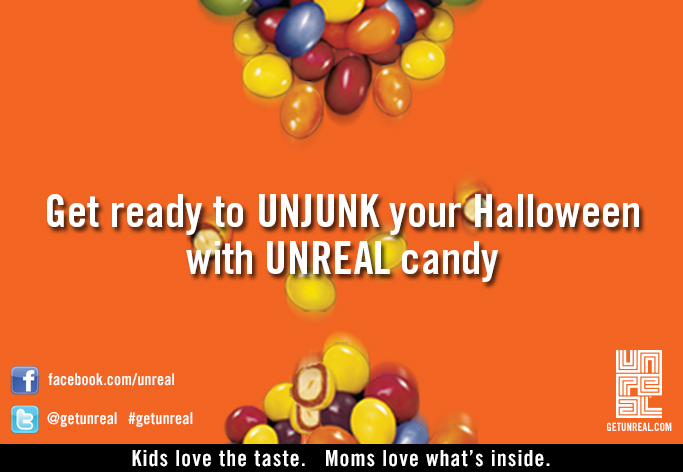 UNREAL candy uses real cane sugar, real milk, more Cacoa, more protein and fiber. Oh, and did I mention, a whole lot of goodness? After trying different candies, I can't say it doesn't tasted different, because to someone like me with highly developed taste buds, it does. But, that being said, it tastes great! I will have no problems switching over. I especially like the chocolate caramel peanut nougat bar. The ladies who attended my party enjoyed it all, too! In fact, we wished we had spent less time on lunch and more time on dessert! Thanks, UNREAL, for finally providing me with a candy that makes me feel better giving it to my kids, as well as myself! Thanks for UNJUNKING candy! Even the dog wants in on the taste testing! Disclosure: Thanks to Global Influence and UNREAL Candy for sponsoring this party. I was compensated for supplies as well as for hosting this party. The opinions expressed, however, are my honest opinions. Thank you for the review. I hate that so many candies and products have GMOs and corn syrup. This gives me a new confidence. I will definitely be looking for this. Love your honesty that yes it tastes different but it's good. I can definitely tell you if I'm eating the real thing or not. But after seeing that you tried it out I'll be willing to check this out! This candy sounds like it is a great product! To get candy to eat without so many bad chemicals! I like the chocolate gooey candy that I have seen when I looked at their website! What a great idea...I hate all the foods with corn syrup. They try to tell us it is the same as sugar, but how come the calories are higher on the corn ones? I'm checking this place out. Thank You! What a fantastic story of how they started. My whole family of four loves candy. If I can get some candy that are not so unhealthy, I would grab them! Thank you so much for sharing this.